While in the Southtown area of San Antonio for a stop on the Herb Society Garden Tour last week, we took a little time to walk the block to check out neighboring houses and front gardens. Southtown is a neighborhood of artists studios, local restaurants, and contemporary shops which are revitalizing the area. 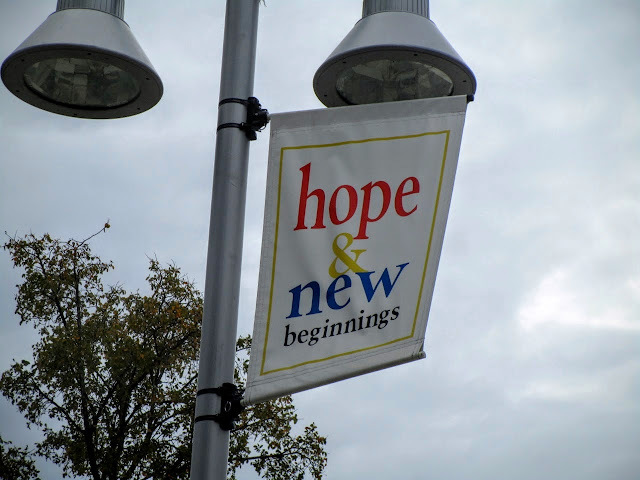 It's very close to the popular King William Historic District and is a less expensive option for those who choose to live in town or establish a new business. Next door on the west side of the "Urban Chic" house shown on tour is this charming cottage with a beautiful coral vine blooming along the fence and a contemporary kinetic sculpture in the yard. We had a great time on the San Antonio Herb Society Garden Tour last Saturday. It was a tour of real gardens done by homeowners throughout our city and they, along with knowledgeable vounteers, were on hand to answer questions. Many provided handouts describing the theme of their gardens complete with plant lists. To see the first five gardens on the tour start here. Although I prefer to show my city at its best, I must also call them as I see them. We toured six gardens but this final one was not worthy of being on this tour. Sorry to say that this one garden was a complete waste of time. This week I'm posting gardens from The San Antonio Herb Society Garden Tour. The last garden Ragna and I toured was the "Xeric Garden" in the far north suburbs. 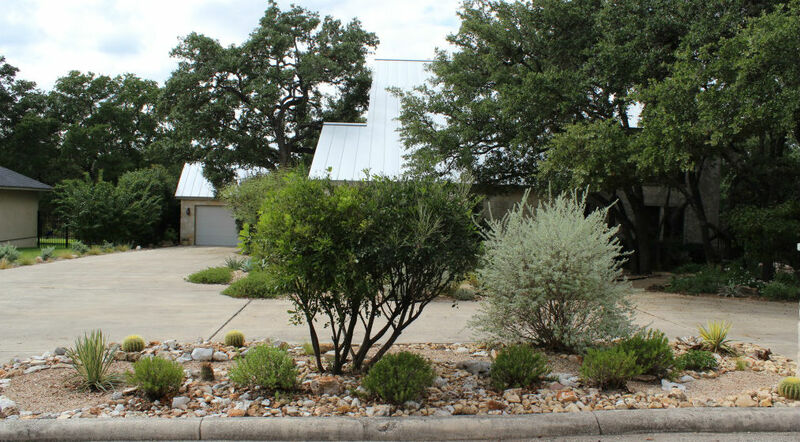 The view from the street with Blackfoot Daisy, bush germander, and native ornamental grasses (possibly Lindheimer's Muhly). The euphorbia surprised since the sun kills mine. We didn't get a plant list at this stop so some guessing is involved. Zoysia lawn, in excellent shape, surrounded by beds of drought tolerant plants. 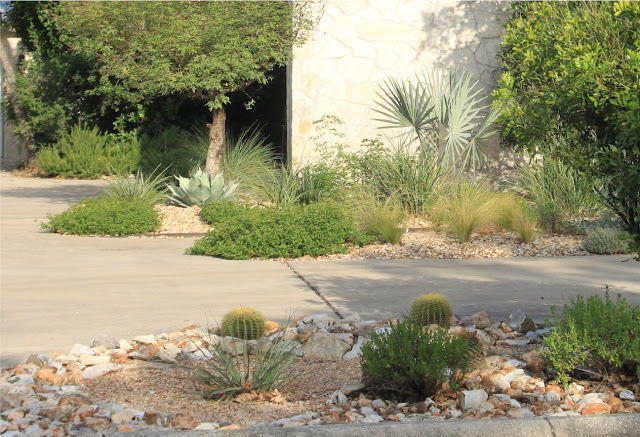 This week I'm posting gardens from The San Antonio Herb Society Garden Tour. The fourth garden on our tour is the "Re-purposed" garden located in the suburbs west of town. My friend Ragna accompanied me on the tour and we had fun visiting this colorful garden full of ideas for recycling and reusing found items. The Herb Society of San Antonio held a garden tour this past Saturday and friend Ragna and I took the opportunity to check out some special gardens in our city. "Urban Chic" is the third garden on our tour. Located in the Southtown neighborhood of older homes near downtown currently undergoing revitalization, this house was built on an empty lot and completed in March 2010. 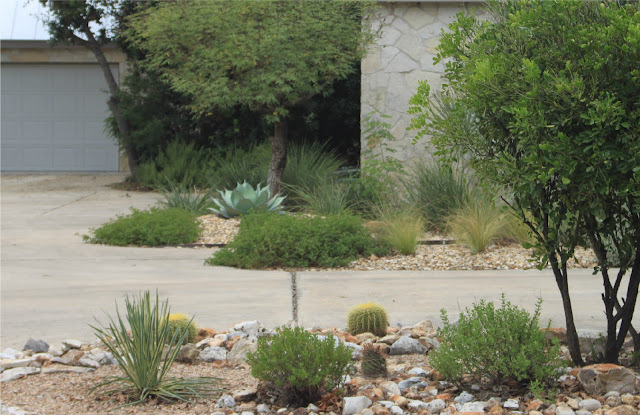 The second garden on The San Antonio Herb Society garden tour is the "Texas Eclectic Garden" located in a tree-filled older neighborhood northeast of downtown. The brochure promised a bit of everything and we were not disappointed with lots of ideas to add to our garden. A welcoming Texas-style porch and shady front garden greets visitors from the street. This past weekend I attended the first annual San Antonio Herb Society Garden Tour along with my friend Ragna. The tour showcased a wide range of neighborhoods and gardening styles with enthusiastic owners and volunteers ready to answer questions from visitors. I'll share gardens from the tour throughout the week. The first garden is a colorful cactus garden in northeast San Antonio. 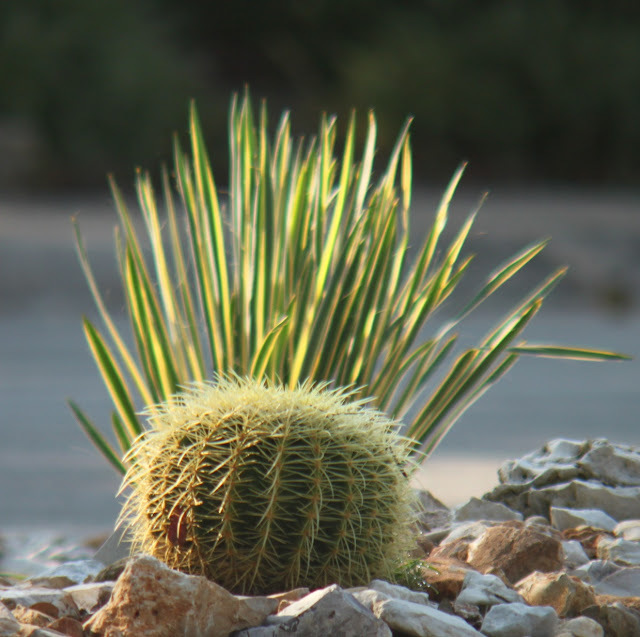 Marty Ruona is known as "Cactus Marty", so when we saw his garden would be on the tour, we could hardly wait to visit. It was even better than anticipated because there's a lot more to his garden than cacti, succulents, and palms. From the street the garden is beautifully designed and, despite the prickly plants, invites you in. Traffic cones in front of the house meant the full effect of the street view was not blocked by cars. The manicured lawn is a lush counterpoint for the all his spiky plants. Colorful containers painted by Marty are featured throughout the garden. These are along the driveway. The front yard from the side manicured lawn with a colorful tire planter, the best I've seen. Marty was there to greet visitors and answer detailed questions. Here he is with Ragna. Turn up the volume on Waylon, Willie, and the boys. We're headed around back to the party zone where tequila tastings are a regular event. When he's not working on client's projects for his landscape design business, he's using reclaimed wood to build colorful garden furniture and plant displays. The vintage turqouise Weber grill is one of a collection on display. The house is painted with 13 different colors. A shade house converts to a greenhouse in winter. Marty purchases plant collections from those who can no longer keep them. At the end of the trail is a place to sit while admiring an enormous beaucarnea and the rest of the collection. My thanks to Ragna for sharing her photos of some of the details of the shadehouse, including this miniature "Cactus Marty sign below. The San Antonio Herb Society tour benefits culinary scholarships to St. Philip's College here in San Antonio. The San Antonio Herb Society also holds is one of the sponsors of the popular San Antonio Herb Market event held each year by the Herb Market Association. This year the market is on October 20th at The Pearl. We visited six gardens on this tour and tomorrow I'll share the "Texas Eclectic" garden. 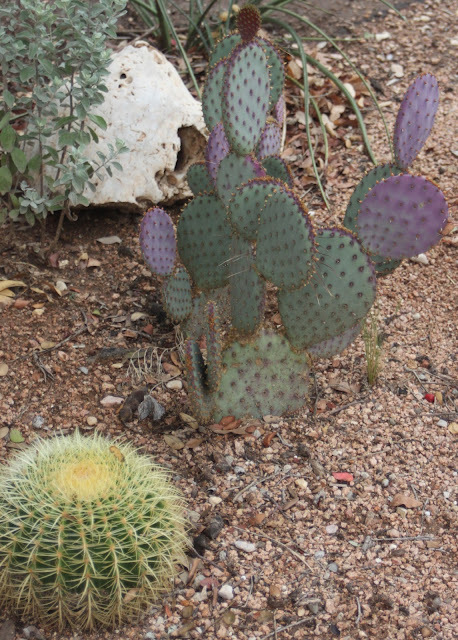 This post continues my "ABCs of Plants in my Garden" series and highlights the letter O for Opuntia or the cactus known as prickly pear. The prickly pear cactus is so common here in Texas that until recently I wouldn't have imagined planting them in my yard much less writing an entire blog post on them. But my attitude toward them has changed. Most of the opuntia on the list are planted in the cactus patch along the creek in the back yard and were acquired from Jean "the cactus guy" we found on craigslist. Today is Foliage Follow-up when Pam at Digging hosts blogger posts on foliage in our gardens the day after Garden Blogger's Bloom Day. Fall is the best time to get new plants in the ground and an opportunity to move plants that aren't working. That's just what we did yesterday by replacing an existing Dasylerion wheeleri with this new Yucca filamentosa 'Bright Edge'. The change certainly brightened up the mailbox strip. D. Wheeleri, with its sphereical form of spiky foliage. is a favorite of mine but this one didn't work here. It blended in too much, didn't grow well, and never looked quite right so it's been relocated to the back yard. Here's the 'before' with the D. Wheeleri in the left foreground. Now the "after' with the new Yucca filamentosa 'Bright Edge' in place. Yucca filamentosa 'Bright Edge' is similar to the existing Yucca filamentosa 'Color Guard' with thinner leaves and the reverse variegation showing more green which which works well with existing plants like the Golden Barrel cactus (Echinocactus grunsonii) without being too much the same. The Color Guard yuccas planted last spring have grown more than expected this summer and brighten both sides of the driveway and across the front adding spots of color when the salvias are not blooming. The new Y. filamentosa is in the back right across the driveway. 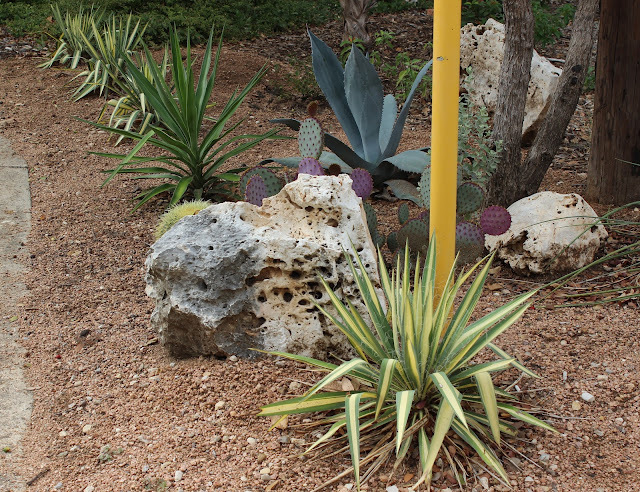 The 'Color Guard' yuccas continue on the other side of the driveway where they are joined with a silvery agave, soft leaf yucca, another golden barrel cactus, and Texas native purple prickly pear cactus (Opuntia macrocentra Santa-rita 'Tubac'). Of course all these selections were designed to coordinate with the yellow street sign. Do you think the city would notice if I repainted the pole to a creamy yellow? Here's a better look the purple hue of the prickly pear which has become more intense as a cool front passed through this week. These changes gave me the chance to try out my new wide-angle lens. Previously it been a challenge to get an overall view of the yard since I had to break it into three photos each time. With the new lens I can get more in the picture. Here's the front hellstrip showing how the new yucca on the left fits in. I could step back farther into the neighbor's yard, but the details get smaller. You can always click on a photo to enlarge it. For more blog posts highlighting foliage in their gardens, check out the links in the comments section of Pam's blog Digging. Tomorrow is Garden Blogger's Bloom Day (GBBD) but my flowers never seem to bloom on cue for GBBD. For September, I've collected blooms from the last few weeks and put them all in one post. It's late summer by the calendar, in San Antonio that means the beginning of our second gardening season of the year as our gardens wake up from their heat-induced summer dormancy and peak around the end of October. Now for what's blooming in my garden in late summer 2012. First up is Gomphrena 'Fireworks', a plant I intend to plant more of next year. Gomphrena taunts our hot dry summers by sending up masses of stunning blooms. Here it is against a background of Mexican Bird of Paradise (Caesalpinia Pulcherrima). Gomphrena 'Strawberry Fields' is also a beauty. In full sun and reflected heat all day, it continues to bloom all summer. Gomphrena 'Fireworks' is in the background. Both plants grew from small 4" pots planted in June. 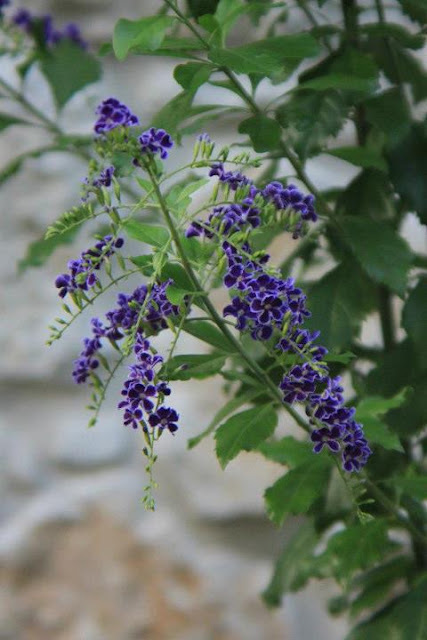 Duranta 'Sapphire Showers' is stunning against the stone wall of the garage. The plant is almost six feet tall with striking sprays of tiny jewel-like flowers. This aloe plant was handed to me as an "extra" at the end of a swap last fall. It fits just right in a little cement pot and the pretty bloom is a nice surprise. 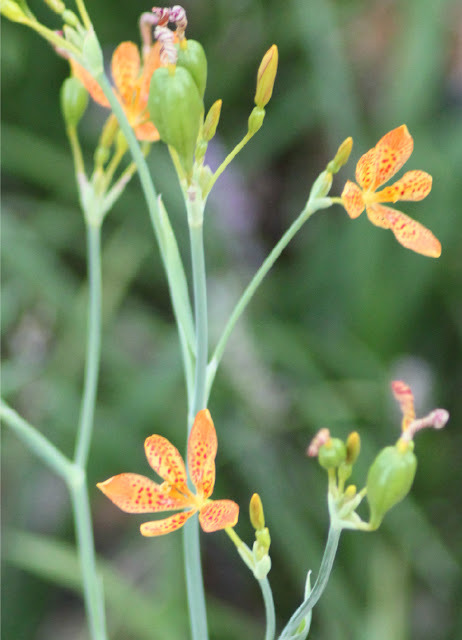 This is the first bloom on this blackberry lily (Belamconda chinensis) sent to me by an internet gardening friend two years ago and I love the delicate color and details. My favorite canna put out this one last summer bloom, which was six feet tall. The garden along the north side of the house provides the best blooms at the end of our hot summer. I posted the story of this garden last fall shortly after I began blogging. Red salvia with tall purple Ruellia in the background. 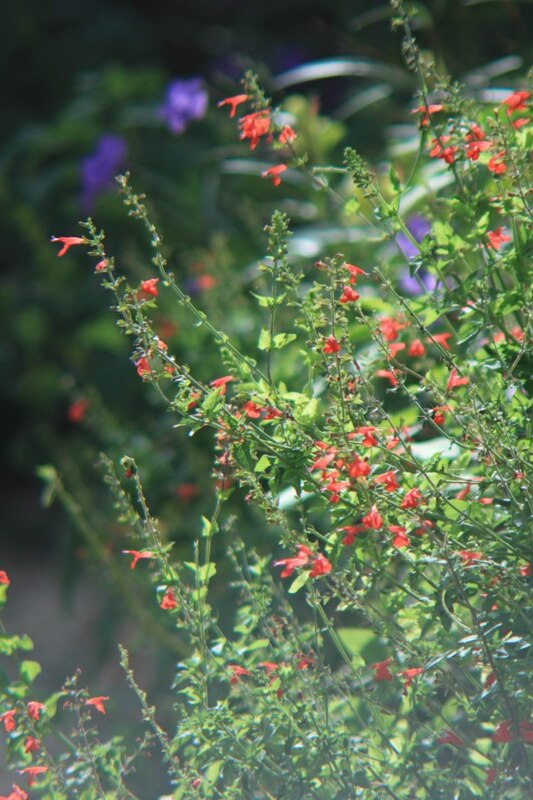 The red salvia was received in a trade so I don't have an ID, but it has been a prolific bloomer all through our hot summer. Nepeta 'Walker's Low' is spilling over the rock edging onto the gravel path and a yellow brugmansia trumpet blooms to the right along the wall. The best blooming news for Fall 2012 is the gardens we began literally from scratch three years ago are beginning to establish and fulfill my vision. And the rains and cooler weather arrived this week (almost 4 inches) after a six week dry spell. Ahhhhh -- Fall is coming. On a sad note: Albert, a gardening friend who shared the Brugmansia shown here and a number of the plants mentioned in previous posts, passed away earlier today (09/15/12). I will miss his delightful advice while fondly remembering him through the plants that still grow in my garden. The ABCs of plants in my garden series highlights the letter N for Nasella Tenuissima or Mexican Feather Grass.